Nicki has worked with corporations, associations, and organizations all over North America, as she talks about the business of life, sales, service and self-marketing. She believes that life is a “sales call” and that everyone has to know how to sell better…or they will be beaten. Whether it is a product, a concept, a service, or an idea, Nicki helps her audience sell it smarter, more easily and with better results. Nicki energizes people and inspires them to achieve excellence. She knows that though information is a powerful tool, when blended with inspiration…it becomes unstoppable! Nicki helps people to develop this winning combination and become more effective, successful and fulfilled. Nicki's Seminars bring humor, self-motivation and provide take-away tactics to position people for success and enhance their personal as well as professional life. 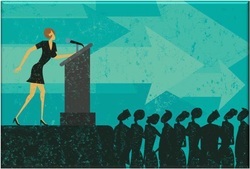 "SELLING IS A WOMAN'S GAME"
being held in Charleston, SC, COMING SOON! 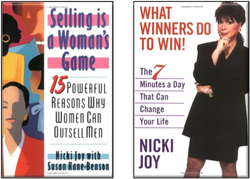 "Nicki Joy is one of the most practiced, polished and professional sales motivators in America today. She gives you proven methods and techniques that you can use immediately to increase your sales. It's a delight to listen to her!" "Possibly the best speaker...the most on target...for any meeting I have run in 18 years! Our audience rated Nicki Joy's presentation the best part of our three day meeting, and I continue to receive thank you letters from participants who found Nicki's presentation meaningful, motivational and entertaining. The most consistent request for our second "annual" conference is to book Nicki again!" "She makes the air crackle with the intensity of her enthusiasm." "All the accolades I have heard about you are so well deserved." "Your name says it all." "Throughout my career in the newspaper advertising business, I have attended many seminars, and I rate yours as being one of the best." "Nicki is so dynamic. It was fantastic!" "Your seminar programs are not only inspirational and professionally conducted, but among the best we have ever attended." "We've met our sales goals each month since you were here... Thanks for a fabulous day, Nicki." ”Nicki you were just what they wanted and needed. They loved you."